Tohoku University gutted its landmark engineering building a few years ago, leaving the brick facade intact. From the outside, the Advanced Institute for Materials Research (AIMR) looks much as when it was built in 1924, but inside all has changed. In place of the old, dim warren of separate research rooms is a bright, airy facility with common equipment rooms. This architectural revamp was not just cosmetic. The purpose, says Susumu Ikeda, administrative director of AIMR, was to allow what he calls academic fusion to flourish. Intellectual walls had to collapse. Scientists were lured from around the world and encouraged to submit proposals for interdisciplinary research. English became the institute’s lingua franca. In particular, says Ikeda, they wanted to use the universal language of mathematics to catalyze interactions between physicists, chemists, and traditional materials scientists. Tohoku’s makeover symbolizes Japan’s bid to halt the slide in its international research performance. The government is trying to create more internationally collaborative science by transforming the nation’s insular higher education sector from within. Tohoku’s AIMR was one of five founding World Premier International Research Centers (WPI) launched by the Ministry of Education, Culture, Sports, Science and Technology (MEXT) in 2007. 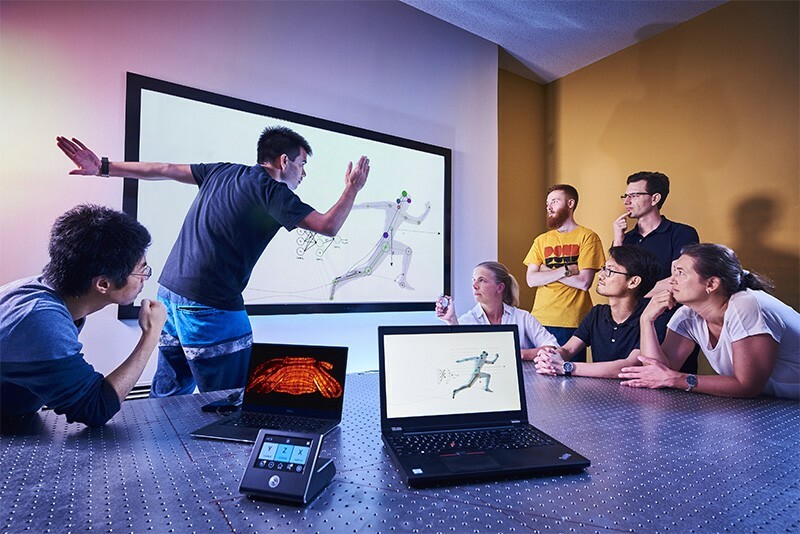 There are now 13 of these institutes, each given long-term financial support to produce excellent science, on condition that they strive to become “globally open” centres of interdisciplinary research. The cost of the WPI programme so far is close to 100 billion yen (US$914 million). Yet, there are questions about whether the government is getting value for money. With many years of flat public spending on science, investing heavily in a handful of star academic institutions inevitably means cuts elsewhere, says Toru Nakano, a stem-cell researcher at the Graduate School of Frontier Biosciences at Osaka University. Without more fundamental reform of universities and research funding, Japanese science overall will continue to decline, critics say. 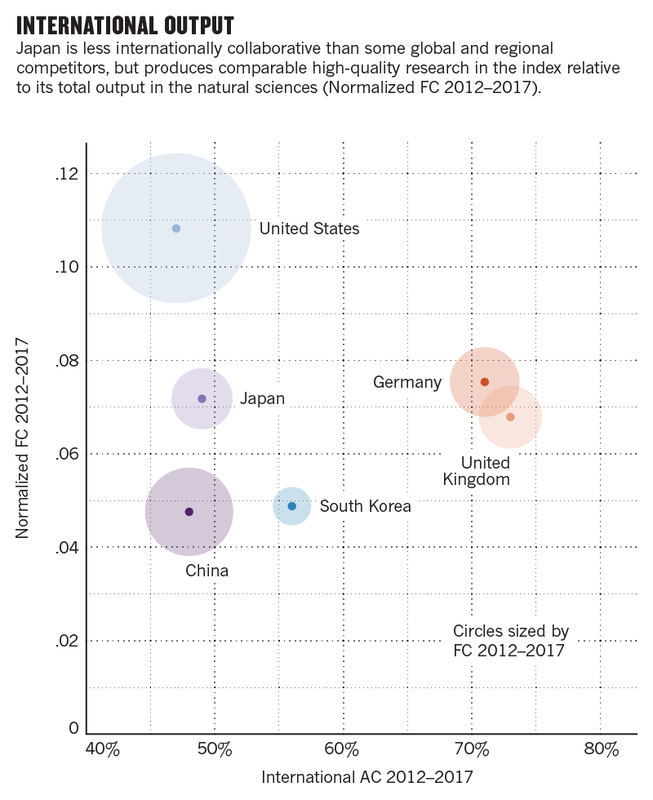 Though still a science superpower, Japan has steadily slipped behind leading competitors, according to the Nature Index, which maps high-quality research output. Japan suffered a 19.9% drop in output from 2012 to the end of October 2018. The research downturn is “extraordinary,” lamented a UNESCO science report in 2015. One reason for the decline, the government concedes, is that Japanese universities are still strikingly insular. The number of foreign students enrolled in higher education in Japan has grown in recent years to about 188,000 in 2017. But fewer than 5% of full-time Japanese university faculty in 2015 were from abroad, according to MEXT statistics. In the United Kingdom, for example, it was close to 30%. Inadequate funding for basic research is compounding the problem, notes Peter Gruss, president of the Okinawa Institute of Science and Technology Graduate University (OIST). Japan spends about 0.65% of its GDP on higher education and government research institutes, in comparison to about 1% in his native Germany. Spending on research in Japan, he says, has stayed still, while most other countries have overtaken it. OIST is perhaps the nation’s most radical attempt to reverse the academic slide. The graduate university has no departments: chemists, physicists, mathematicians and biologists share laboratory equipment and resources. With about 50% of its faculty from outside Japan, it has one of the most diverse research cohorts of any university in the country. English is the official language. OIST is among the top 20 Japanese institutions when assessed on its multilateral collaboration score January 2015–October 2018, an index metric that looks at the contribution to high-quality research papers by OIST and its international collaborators. The institute’s fractional count in the index has doubled over the past three years, from 13 in 2015, to 30 in the year leading up to October 2018. Replicating this nationally is not easy. OIST was built from scratch (it opened in 2011) and its roughly US$2 billion costs have been paid directly by the Cabinet Office, bypassing any bureaucratic meddling. Located more than 1,500 kilometres from Tokyo in subtropical Okinawa, it is as cut off from Japan’s mainstream academia as it is possible to get. Still, Gruss says Japan could get much better value for money at its older institutes. He recommends targeted funding based on the European Research Council model of awarding starting grants to young researchers. This would give them the freedom to be creative and to choose where they work, while breaking the stultifying hold of department heads, and creating competition between universities keen to attract talent. Universities should also dismantle what he calls “the stiff and rigid departmental structure” and focus on their research strengths. “That will only work if they think competitively,” he adds. In other words, they need to recognize that they are in a struggle for resources and research results. MEXT has long acknowledged Japan’s relative underperformance, and the need for more internationalisation, targeted funding, and loosening the hold of older professors over research departments. In addition to more money, department heads have been given autonomy to override hierarchies and recruit anyone they want. After 10 years of funding (worth more than US$11 million a year), which ended in 2017, AIMR is heralded as one of the project’s successes. About 40 of its 100 researchers are not Japanese. It has deepened partnerships with University College London, the Polish Academy of Sciences, and other foreign collaborators. The institute says the number of papers published annually in high-impact journals has increased by a factor of nine since 2007. Among Tohoku University’s recruits, for example, is Thomas Russell, a leading engineer from the University of Massachusetts Amherst who holds more than 30 patents for his work on polymers. Joseph Takahashi, a neuroscientist from the US, credited with identifying the genetic basis of circadian rhythms, now works at the International Institute for Integrative Sleep Medicine, University of Tsukuba, another WPI designate. 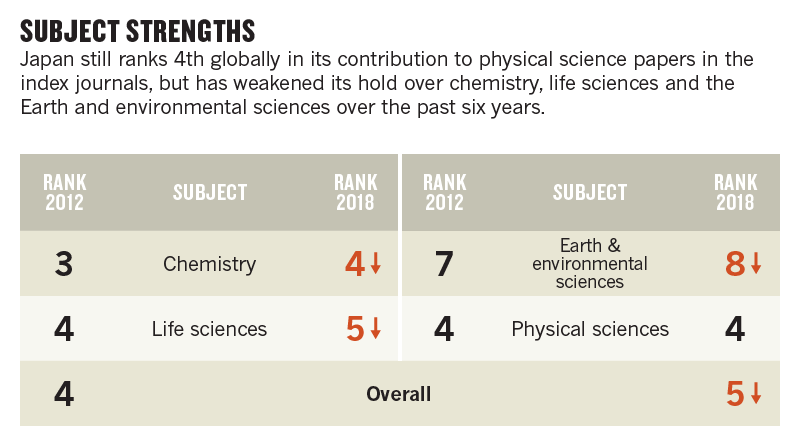 Several WPI institutes have achieved landmark results. The sleep institute cites the discovery of a gene (SIK3) that regulates sleep, and a specific population of neurons that promote non-REM sleep at the expense of REM sleep. Two researchers from the WPI Kavli Institute for the Physics and Mathematics of the Universe were part of a team that won the 2018 Breakthrough Prize in Fundamental Physics for sending out a probe that captured detailed maps of the early Universe. The broader evidence also suggests that Japanese researchers are stepping out of their intellectual cloisters. 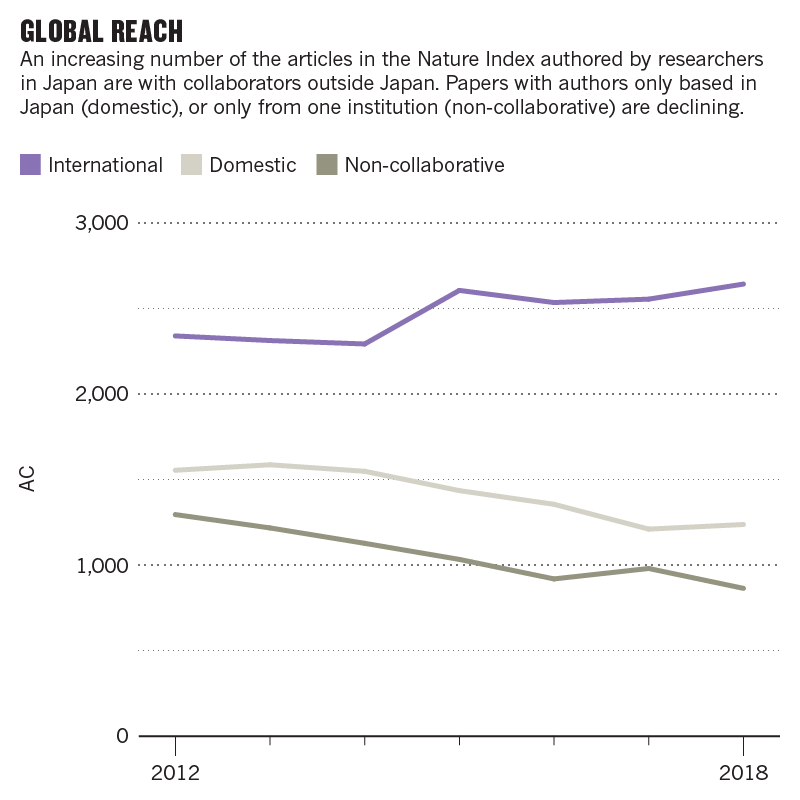 Nature Index shows a rise in Japan’s internationally co-authored papers, which increased from 45.1% to 55.7% from 2012 to October 2018. That put Japan ahead of the US (52.6%) and China (49.9%) on this measure, but behind the UK (77.5%) and Germany (75.2%). Moreover, Ohora notes, Japan has halted its international decline in what MEXT calls “hot research areas” such as immunology and condensed matter physics. “This is good news for us,” he says. Japan’s investment in costly infrastructure, such as the Kamioka Gravitational Wave Detector (KAGRA), a 16.4-billion-yen machine designed to detect cosmic ripples, is generating more collaboration with foreign scientists. Government funding for a new synchrotron radiation facility at the Tohoku University campus is also expected to boost its multinational research programme into atomic and molecular science. Yet, there is little room for complacency. Japan’s population has decreased for seven consecutive years, meaning fewer university students and future researchers. And with the largest public debt in the industrialized world, it has less fiscal wiggle room than its competitors. The government may have to become more ruthless in slashing the academic chaff: under-performing research units. 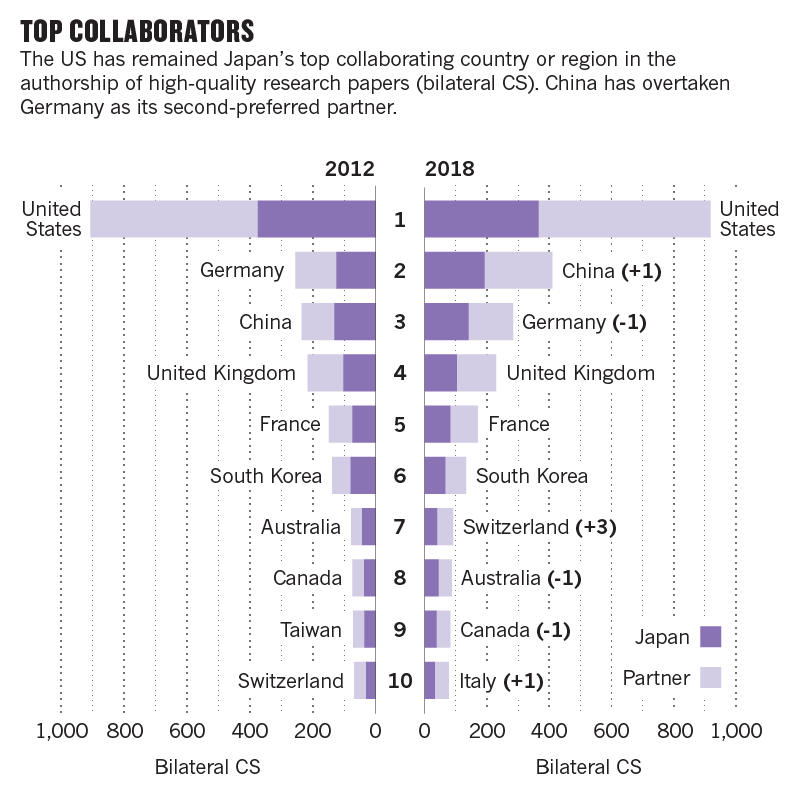 Ohora notes that Japan lags well behind the US in biotech and information technology, hinting that it should continue to prioritize induced pluripotent stem (iPS) cell technology, robotics, chemicals and other Japanese research strengths. Shinzo Abe, Japan’s prime minister, appears alarmed by Japan’s deteriorating science performance. Last year, the Council for Science, Technology and Innovation, the government’s science advisory body, announced a 7% rise in spending on science and technology (to 3.84 trillion yen), after years of stagnant funding. The government is considering another 100 billion yen for the upcoming fiscal year to pay for exploratory research aimed at achieving what The Mainichi newspaper calls “moonshot” results. The government is on track to hit a goal of spending 1% of GDP on science and technology in higher education by 2020. This extra cash is welcome, but experts say it will not increase Japan’s global research profile. Indeed, says Masashi Yanagisawa, who runs the sleep institute in Tsukuba, government may be part of the problem. Few full-time government staff have research experience, he says, and the Japanese Cabinet lacks a science minister. David Swinbanks, founder of the Nature Index, is on the OIST board of councillors. He had no editorial input for this article.